Q: My horse is prone to shoe boils on his elbows. What are the health risks and how do I prevent this problem? A: A shoe boil refers to an inflammation of the bursal sac of the elbow and is generally a result of trauma to the area. 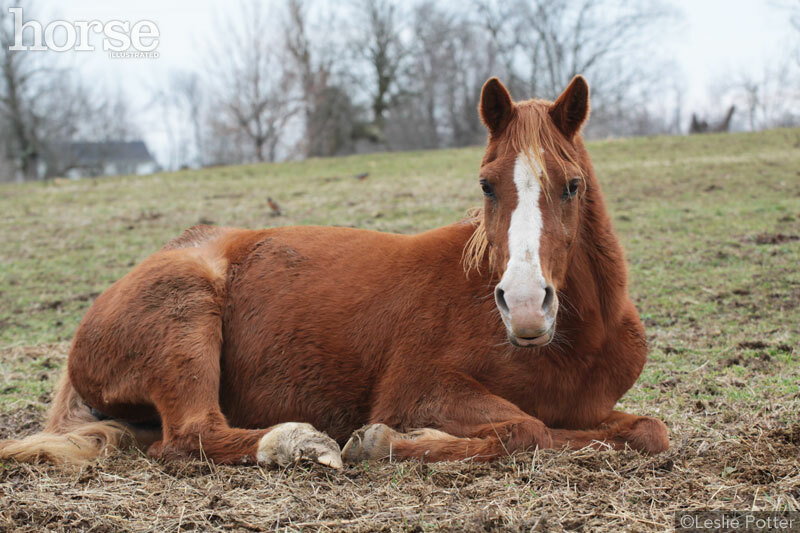 Usually this occurs when a horse lies down and hits his elbow with his hoof or shoe, hence the moniker. Over time, the bursa swells and inflames: sometimes it develops an infection; sometimes it’s nothing more than a cosmetic sore, referred to as a capped elbow. If infection occurs, it’s difficult to resolve. Even when the injury is no more than a cosmetic swelling, a wad of dense scar tissue is left behind, and the area sticks out from normal surrounding skin, so it’s prone to be further traumatized by the hoof. One way to prevent or manage a shoe boil is by using a hard rubber “shoe boil ring” that is shaped like a donut and buckled around the pastern. When the horse lies down, the rubber donut forms a “spacer” between the foot and elbow; the rubber donut contacts the elbow, rather than the hoof or horseshoe. For horses that are kept in stalls, another tip is to bed with plenty of shavings; the added bedding can act as a spacer between the elbow and hoof. It can also be helpful to modify a horse’s shoes so the backs of the branches (or the bars on eggbar shoes) don’t protrude so far out as to traumatize the horse’s elbows when he lies down. With any physical sign of an abrasion on the point of the elbow, take proactive measures to prevent further trauma. This will head off a simmering shoe boil before it becomes a chronic concern. Expert: Nancy S. Loving, DVM, is a performance horse veterinarian based in Boulder, Colo. She is also the author of All Horse Systems Go. What is good to put on hoof boils topically. What do you think of vetricyn as topical treatment? We are taking our horse to the vet today. He has a hoof boil or “capped elbow”. This was caused by improper shoeing by a prima dona horseshoer that would not listen to us. Now we have to have it removed at great cost. I would like to let everybody know that if your farrier does not listen to you, don’t let him shoe your horse!!!!! My horse to day was dignose with shoe boil- capped elbow. Where would I look for shoe boil donut to purchase to help relieve his issue.